Non-enveloped, head-tail structure. The icosahedral head is about 60 nm in diameter. The non-contractile tail is about 120 nm in length with a large baseplate. Linear dsDNA genome of 31 kb, containing about 50 genes. The genome has cohesive ends. 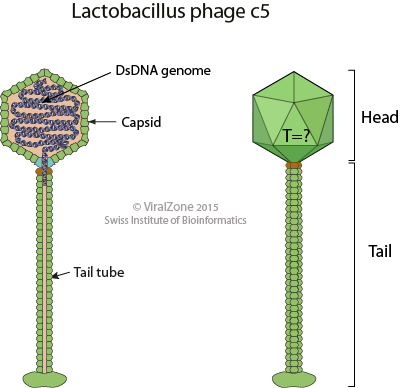 Adsorption: The phage attaches to target cell adhesion receptors through its tail fibers. Ejection of the viral DNA into host cell cytoplasm by long flexible tail ejection system. Transcription and translation of early genes. Assembly of an empty procapsid and packaging of the genome. Viral tail fiber assembly and viral tail assembly.